If you’re familiar with Arthur Bear, you’ll know he’s a bit of a jetsetter, often seen in tropical countries and tourist hotspots, and even hanging out with celebrities. Although 2017 seems like it was ages ago already, but as it’s still winter and the nights are still dark and cold, we thought it was the ideal time to look back on all that Arthur Bear did last year, see how far he managed to travel and who he managed to meet! He started the year in style, heading off to Tenerife for some January sunshine. Who wouldn’t want to escape the January blues?! February soon came around and at the Spring Fair, Arthur Bear was lucky enough to meet Laurence Llewellyn-Bowen, Miss England 2016 Elizabeth Grant, the Minions from Despicable Me and Elizabeth Hurley! You’ll be pleased to hear that Arthur Price will be at the 2018 Spring Fair too. In April, it was rumoured that Arthur Bear ventured to the moon, but we’re not so sure…it was 1st April, after all! 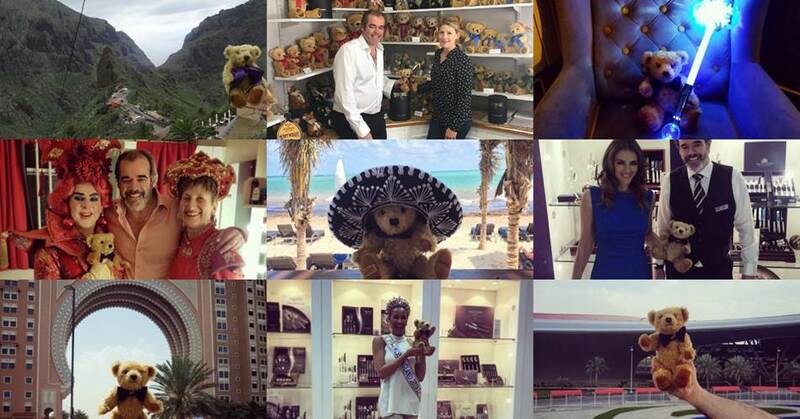 Later in April, Cancun was the real destination of choice, with Arthur Bear spotted in a sombrero on the beach – there are worse ways to spend your time but spring was definitely a busy period for the little fellow. Following a quiet couple of months, July saw Arthur Bear meet chef Simon Smith! He had a brilliant time whipping up some tasty concoctions and in the very same month, he was also lucky enough to meet cricket legends Devon Malcolm and Gladstone Small at Lord’s Cricket Ground! In August, Arthur Bear headed off to Muscat, Oman, then he quickly went for a little trip closer to home, popping over to Edgbaston to support the England cricket team. He wasn’t home for long though, as at the end of the month on the bank holiday weekend, Arthur Bear was spotted at the Qatar Museum in Doha – this little bear really does get around, doesn’t he! Arthur started September with a visit to Amman, Jordan, then he came home to attend the wedding of Tori Price, Simon Price’s daughter – and what a wonderful day it was. In September, Arthur Bear fancied finding out about Croatian culture and headed off to Dubrovnik for a weekend! Later in the month, he popped to Zanzibar, also known as the Spice Island, to get some inspiration for his next cooking class with Simon Smith. At the end of September, Arthur Bear somehow managed to squeeze in another trip, this time to one of Africa’s largest game reserves—Selous in Tanzania—and he even got snapped with a giraffe on safari! You’ll be pleased to hear that Arthur Bear finished the year off in the best way possible, by spending Christmas with the Price family. Now, what does 2018 hold?